A reclusive former Scottish soldier lay dead in his flat for seven months after falling out with his family. Proud Thomas Yuill, 82, lived alone in a council flat on the notorious Blackbird Leys estate in Oxford. His funeral took place yesterday – but it’s unclear if any relatives were there for the service. 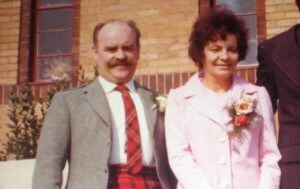 Mr Yuill, who had two older brothers who are believed to still be alive, had a falling out with his family in the 1960s. Council officers twice visited the flat to chase missing rent payments but neither time notified emergency services about concerns for the welfare of Mr Yuill, who was born in Lanark and grew up in the nearby mining village of Kirkmuirhill. Officials knocked and rang the bell – even noticing a “musty” smell – but went away after getting no reply. It was only after a statutory 28-day notice period issued by Oxford City Council expired that officers entered the property and found his body. His decomposing corpse lay just a few feet on the other side of his front door. Family members were tracked down on behalf of Oxford City Council by genealogists Finders International. His niece, Valerie Hall, 67, of Stockton-on-Tees, said she not seen her uncle for decades but said he was “a lonely man and didn’t want company”. Military records reveal Corporal Yuill’s “exemplary conduct” and also note that he received an operational medal for general service in Cyprus. His daughter, Karen, a theatre manager, was born in 1965 and died of cancer in 2009 and his wife Mabel, from whom he became estranged, died in 2011. The next of kin on the council’s books, who would have been the authority’s point of contact, died in 2012. Finders International spokeswoman Kirsty How said Mr Yuill is survived by two brothers, and several nephews and nieces. The city council is now launching a “social isolation project” to contact the more than 700 residents aged over 75 living alone to talk to them about their personal circumstances.